An exciting introduction three hour course offering hands on experience into a variety of glass blowing techniques from gathering glass, shaping and applying colour. No experience required. Continuing students are welcome. 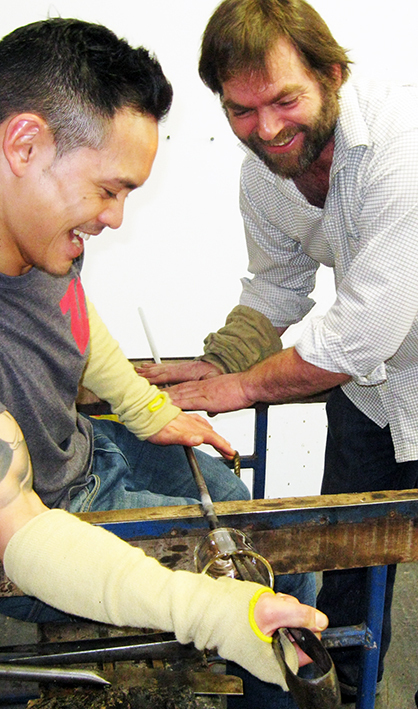 Students create a series of glass pieces from paperweights to blown vessels to take home. Thank you for such a wonderful morning. We can’t wait to receive our priceless pieces of work to show off to all our friends! Thank you so much again for our amazing experience. Please contact SALT Glass for bespoke course dates by arrangement if the calendar dates are full or not suitable.